By mid-morning, the rain disappeared. 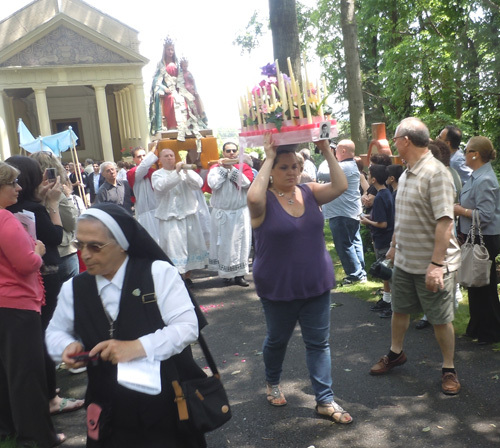 The sun dispersed the clouds and shined down on the dozens who gathered at the Holy Face Monastery in Clifton to honor “Madonna del Sacro Monte” – the Blessed Mother of the Sacred Mountain – and celebrate the incredible recovery of her statue, which had resided in Jersey City for nearly a century. For the past 15 years or so, this rare statue was believed lost, but the determination of one man and a series of improbable coincidences resulted in this unique piece of sacred sculpture being found and restored. Four generations were represented in those who gathered. 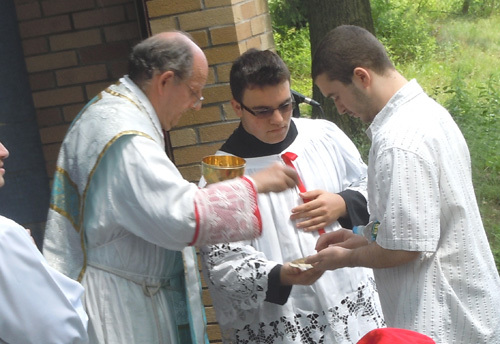 They marked the happy occasion with prayer, hymns, food, stories and laughter. For them, this statue embodies the family history and traditions that define their lives. She invokes cherished memories of family members no longer on this earth. 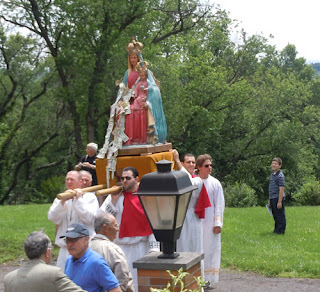 The recovery of the Madonna del Sacro Monte statue is a story that spans decades, continents and generations. But the various strands of the saga of this beloved statue share a single nexus point: Jersey City. “The roots of Jersey City are everywhere,” said Patrick O’Boyle, a North Arlington lawyer whose dedication to this icon led him on a long plight to save the statue that his family members – all born and raised in Downtown Jersey City – remembered so fondly and talked about so often. 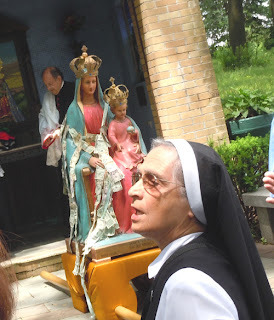 Holy Rosary Church on Sixth Street was the home of the Madonna del Sacro Monte statue for decades. Considered the oldest Italian Parish in New Jersey, Holy Rosary was a sanctuary for Italian immigrants throughout the early 20thcentury. 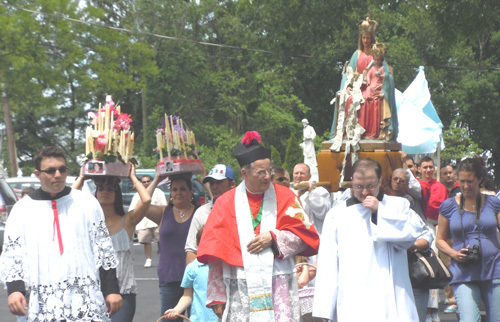 The annual “Italian Feast,” in Jersey City, was originally organized in 1912 by the Maria S.S. (“santissima”) Dell'Assunta Society – Mary Most Holy of the Assumption Society – a group of piasanos from Morrone who donated a statue of their incarnation of Mary to Holy Rosary. Piasanos from other Italian villages also coalesced at Holy Rosary, adding devotions and statues of other Blessed Mother incarnations to the parish community. 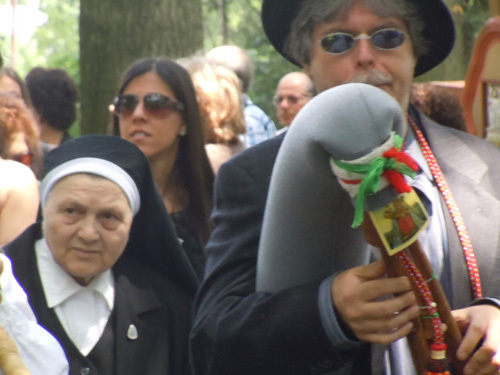 The Madonna del Sacro Monte was a devotion for the immigrants from the Cilento region of Southern Italy. 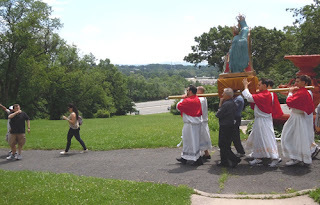 The “Sacred Mountain,” which those boring secularists call Mount Stella, houses the Sanctuary of Maria SS. Sacro Monte. I cannot seem to find much information on the specific source of this incarnation, although the image does not seem rooted in the appearance of an apparition, like Our Lady of Lourdes. Young Jesus, straddling her left leg, is holding in his left hand a “globus cruciger,” which is an orb with a crucifix on top and symbolizes absolute authority over the entire world. Orbs as symbols of global power first appeared in antiquity, in the hands of statues of Zeus or Jupiter. The crucifix was added with the advent of Christendom. The Child Jesus of Prague icon, which dates back to the 16th century, also depicts Jesus as a curly headed child monarch, one of the few images other than the Madonna del Sacro Monte featuring a baby Jesus as royal ruler. The Child Jesus of Prague wears an elaborate crown and his left hand holds a globus cruciger. The genesis of this very regal Madonna with child may be unknown, but the icon and her devotions date back to the Middle Ages. The accessories of monarchy – throne, crown, orb – assert power. Compared to other Mariology images, which tend to emphasize a reassuring serenity, this Virgin Mother is Pro-Active. For more than a millennia, Italy was not really a single nation but a collection of principalities constantly at war with each other. Southern Italy was more often than not the battlefield, in addition to being perpetually plundered and pillaged by invading Arabs, Africans, Greeks and Turks. 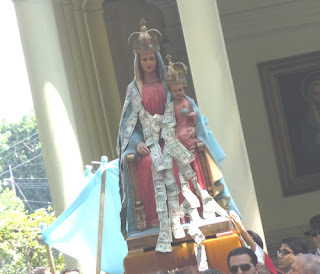 One might speculate that a Mary with Savior image that projects such unmistakable authority also served a political agenda: it reinforced the independence of the people of Cilento. Regardless of whatever army enforced a claim of ownership over the region, the people remained loyal to a higher authority. And, in contrast to the Italian and Foreign War Lords wreaking havoc, that authority was unequivocally Matriarchal. Sarco Monte is the highest mountain in the Cilento region. Pilgrimages to the top of the mountain, where the Sanctuary is located, were popular among the peasants, but it was an arduous journey of several days. The people of Cilento prayed to this incarnation for intercession. 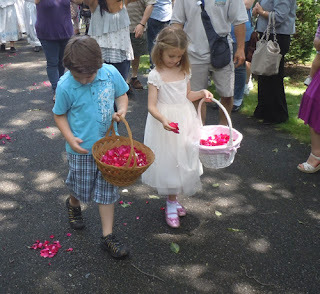 When they came to America to seek a better life, they brought their faith traditions with them. 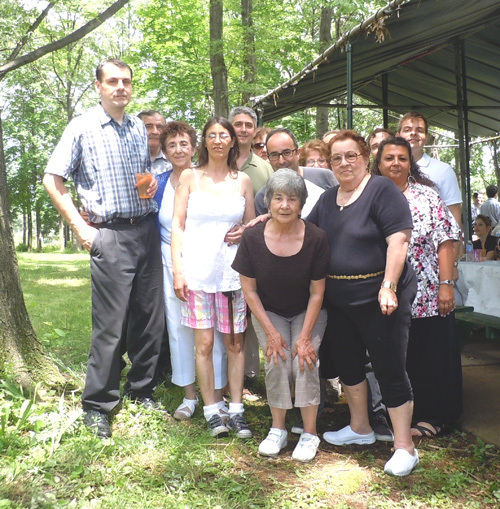 In the 1920s, the height of the Ellis Island era, Jersey City was already home to many Italian immigrants, including several Cilento families. Like other groups of piasanos in town, they pooled their meager resources to bring the patroness of their village to Jersey City. They purchased this life-sized, vividly colored replica of the Madonna del Sacro Monte for Holy Rosary. 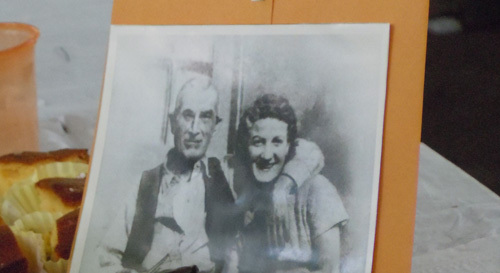 Patrick O’Boyle is Cilento, on his Mother’s side, a Cilento DePaula. 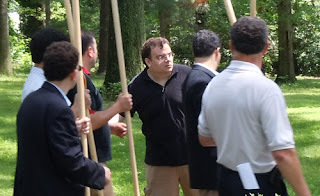 He grew up in North Arlington but his mother is a DePaula (she also is the cousin of my buddyTony’s mother). The most famous Jersey City DePaula is Frankie DePaula, a boxer whose life was short and tragic. Patrick remembered seeing the Madonna del Sacro Monte in Holy Rosary when visiting Jersey City as a child. The mosaic of the Madonna del Sacro Monte at the Holy Face Monastery was donated by Cilento parishioners from Holy Rosary in 1971. Patrick prayed and meditated there. The address of the monastery is Route 3 but you would never know it when you’re on its secluded, hillside campus where trees align a verdant lawn decorated with statues of saints, the 10 Commandments, and the Stations of the Cross. It is an oasis of contemplation. 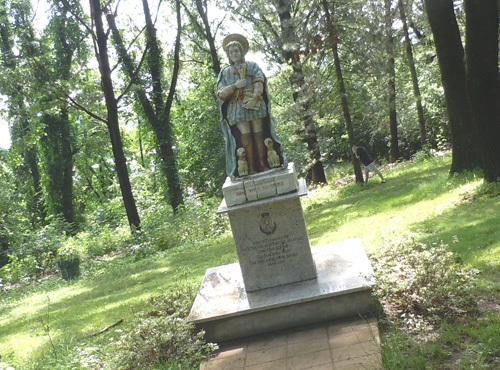 Patrick, with a group of friends, restored the outdoor Madonna del Sacro Monte, which had fallen into disrepair by the last decade of the previous century. In 2008, Patrick was in Italy visiting Cilento and he asked locals about the big mountain in the horizon. They informed him that this was indeed the Sacred Mountain. 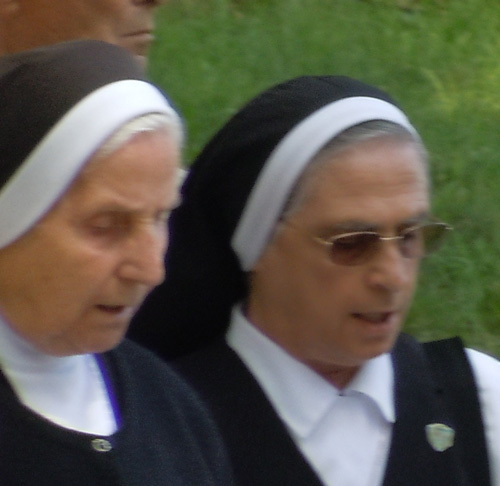 He went up the slope to visit the original Sanctuary of the Madonna del Sacro Monte. His prayer life was enriched; his devotion to this icon increased. After a second trip to Cilento, he promised the Madonna del Sacro Monte to find the original Holy Rosary statue. It would not be easy. He had no idea where to begin his search. The pastor who implemented the purge was deceased; a series of other pastors succeeded him. No one was left who remembered where the statue was sent. 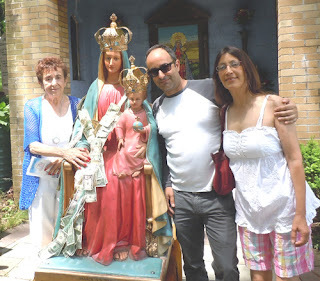 No paper work with possible clues for the whereabouts of the Cilento patroness even existed. 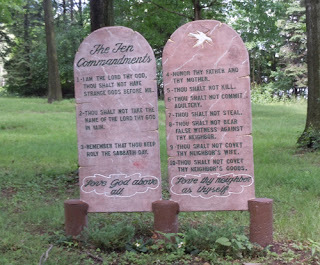 But the store only sold to Churches, not private individuals and the statue was scheduled to be shipped to Arizona. 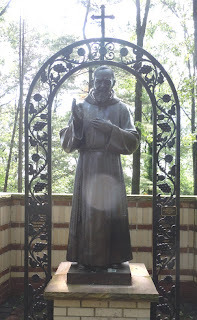 The statue’s price was several thousand dollars, which Patrick did not have and there would be no time to conduct fundraising activities before the ship date. Two days later, Patrick received a surprise phone call from a client, a habitually slow payer who Patrick was about to put into collections. The client wanted to pay his bill immediately and in full. 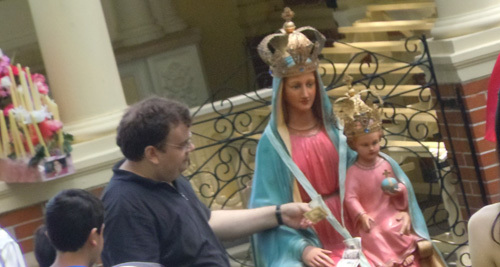 The amount of the bill was the exact amount of the price the antique store owner was asking for the Madonna del Sacro Monte. After convincing the antique dealer he intended to find a church where the Cilento patroness could be displayed, Patrick bought the statue. When he took possession of the object, he discovered that the heads of Mother and Child were bare. The crowns had been removed and sold separately. But a crownless statue is better than no statue at all. 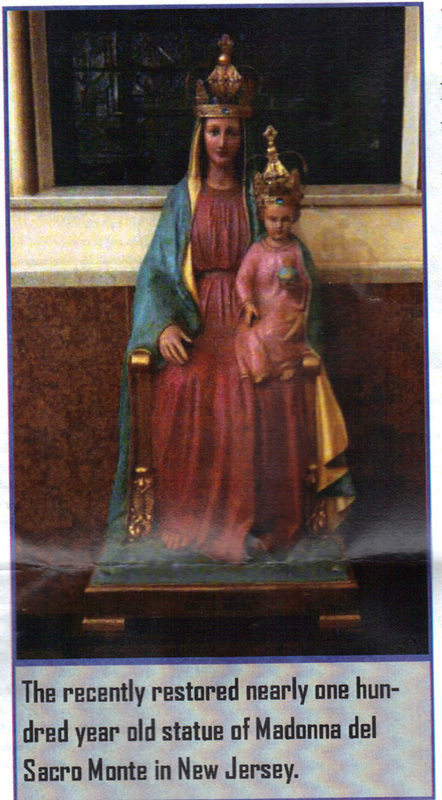 At least the Madonna del Sacro Monte had been recovered. But the statue needed a church for a home, so the faithful could pray to her for intercessions and fulfill devotions. He contacted a family friend, Monsignor Joseph Ambrosio, pastor of Mount Carmel Church in Newark. Monsignor Ambrosio spent 16 years at Holy Rosary church and fondly remembered the statue of Madonna del Sacro Monte. 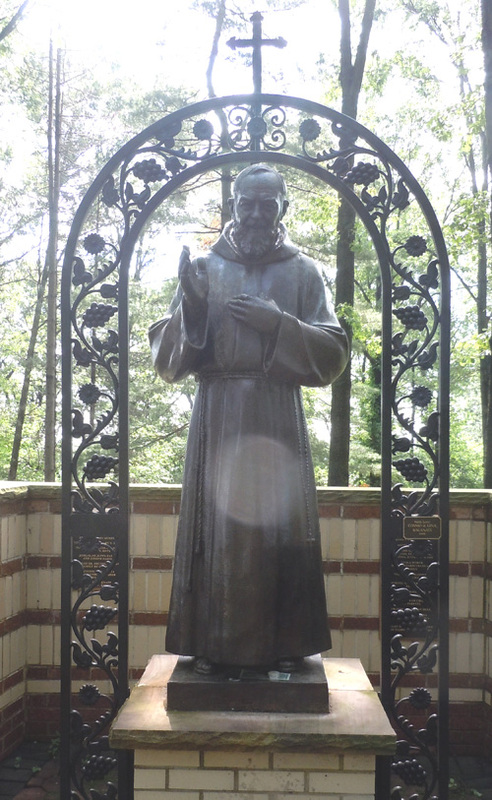 He offered Mount Carmel to be the new home to the statue. 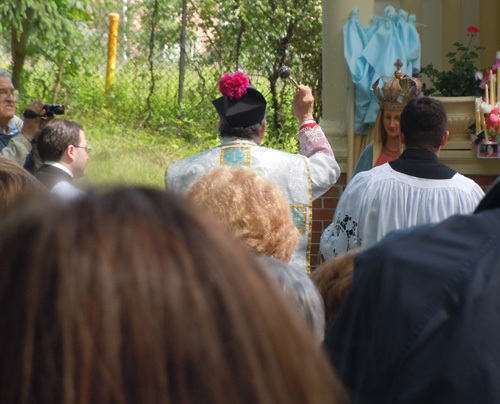 Patrick hired a professional restoration company and delivered the icon to Mount Carmel, explaining to the Monsignor that the crowns were still lost. Monsignor said come with me. In one of the Church’s closets were a set of crowns the Monsignor had purchased from the same antique dealer months before. The crowns are affixed to the heads with what Patrick described as an unusual wing nut system. The Monsignor had bought the crowns for another purpose, not knowing whose heads they were made to adorn. 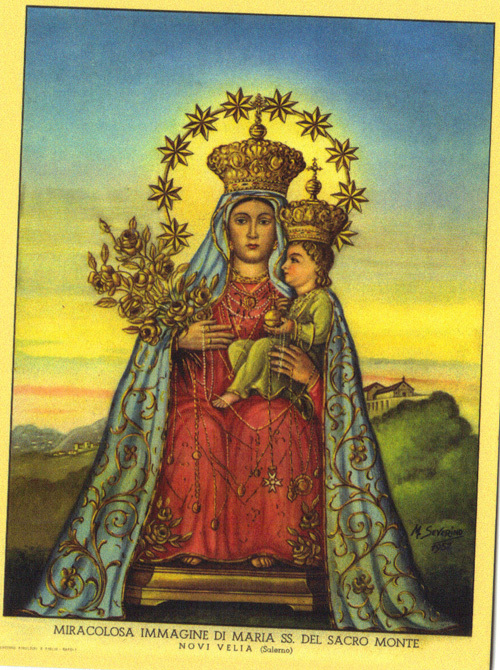 It was soon obvious that the crowns did not merely fit the Madonna del Sacro Monte, they fit perfectly. They were without doubt the original ornaments. So, on June 1st “La Festa della Madonna del Sacro Monte” was celebrated at the annual SOGNA (an organization dedicating to uniting the Cilentani and their descendants) picnic. 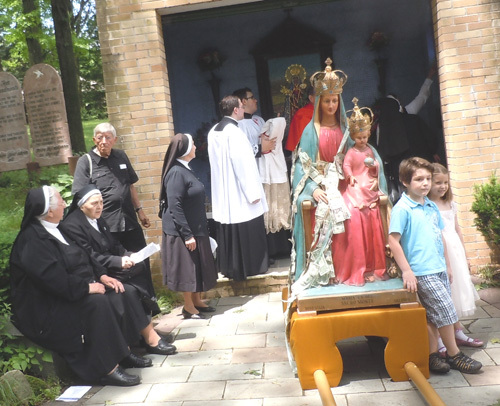 Monsignor Joseph Ambrosio led a bilingual mass – in Italian and English – where he retold the story of the lost and found statue. 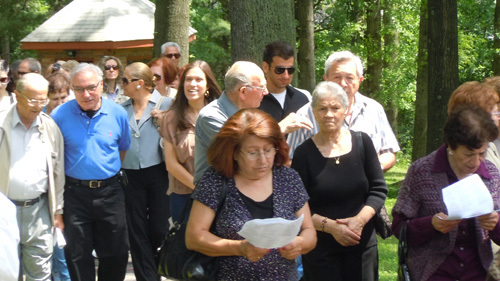 In addition to the Jersey City Cilentaniand their suburban offspring, some distant relatives and other genuine Cilento residents traveled to the U.S. to take part in the ceremonies. 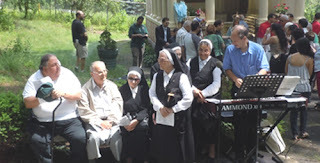 A group of Vocationalist Sisters, of Italian descent, also attended. 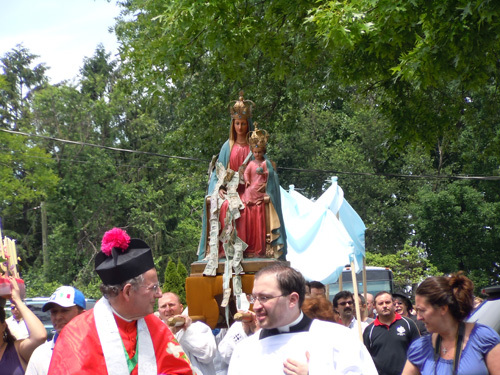 In his homily, the Monsignor pointed out that story of how the Jersey City Statue of Madonna del Sacro Monte was saved, should teach us to always keep hope alive. “We should never lament death before it happens,” he said. After the liturgy, Monsignor Ambrosia blessed the statue with holy water from an aspergillum then led the participants in a traditional Cilento procession. A ribbon was placed around the statue’s shoulders, people pinned money to the ribbon. Two children led the procession, scattering flower petals. 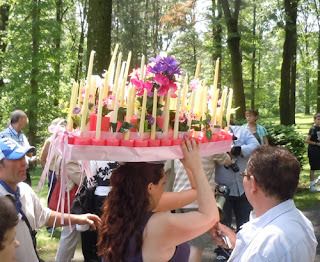 Two women carried elaborate headdresses filled with candles, which symbolized pilgrimages of yore. The peasantry would spend their meager savings on candles to light to the Madonna, and the devoted would carry their possessions on their heads as they trekked up the Scared Mountain. 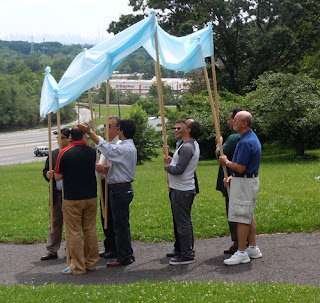 Men carried held poles aloft on which a blue canopy was suspended. 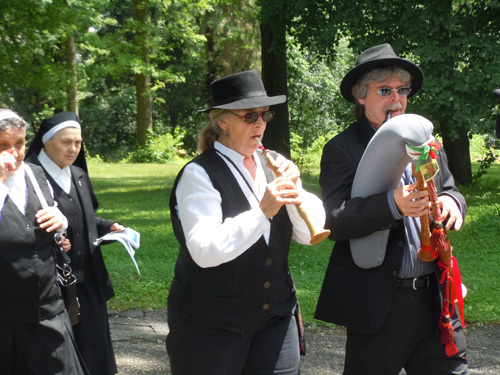 Two musicians, wearing traditional garb, played hymns on a Zampogne -- the Italian bagpipe and a Ciaramella, which is a wooden recorder. 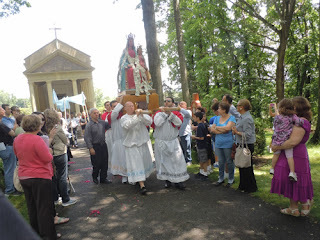 The men who hoisted the life-sized state onto their shoulders were Cilentani who have sworn their devotion to the Madonna del Sacro Monte, and traveled to New Jersey for the occasion. The nuns led the Ava Maries and we processed along the walk way of the monastery grounds. Late spring was in full bloom, the leaves and grass were lush with fresh chlorophyll. 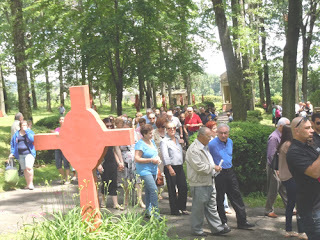 After processing thrice around the church – another tradition – the monsignor led us back to the shrine, where more hymns to the Blessed Mother were sung. People had their picture taken with the statue. As the picnic that followed, sausage and peppers, chicken, penne pasta and several cakes were served. The Ricotta pound cake was particularly unforgettable. They talked in Italian and in English, they talked about their old days in Jersey City, they talked about family. A man now retired, was excited to find out that I actually live in Jersey City. He told me about the old days, the different mayors of Jersey City. He had some stories. He was still angry about the Turnpike exit being built by Center Street, which drove down the property values. Long ago, he moved to the suburbs where he raised his family and now plays with his grandchildren. this is an email that corrects some info in this post. I didn't feel like changing any of the sentences of the post, or the way too complimentary compliments of the email. Just read your excellent article. Just for clarification, Cilento is a region of villages and not one village. Also Monte Stella and Sacro Monte are two different places right next to each other and both have hilltop sanctuaries to the Virgin Mary. They are about ten miles apart. They are the two tallest mountains in the region. NATO has a satellite base next to the church on Monte Stella. 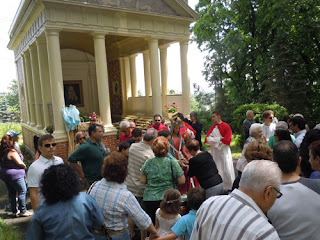 Sacromonte is by far the more popular shrine. Thanks again. You are a gifted writer. By the way, that statue was missing for over ten years. I though odds of finding it were one in a hundred billion. 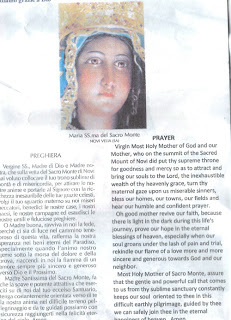 I'm sure you are aware that there is a larger marble statue of OL Sacra Monte, in Holy Rosary in a Marble thrown. That statue is original to the church, incorporated in 1927. Its on the Right Center side, when you enter the church. 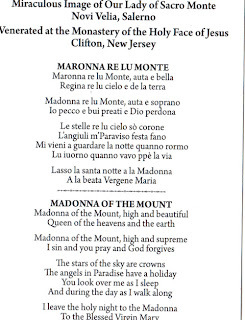 That Madonna is La Madonna del Sacro Monte di Polsi from southern Calabria, not the Madonna del Sacro Monte of the Cilento. 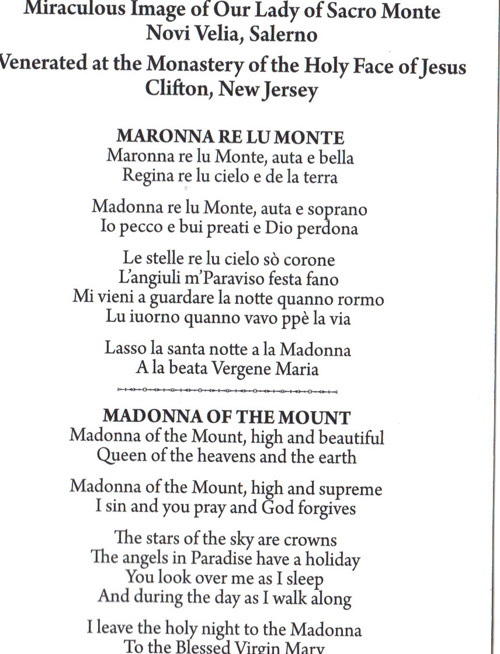 La Madonna di Polsi is also tremendously famous and powerful. VIVA MARIA!!! Thank you, I am glad that the statue was restored and especially that it renews a wonderful faith and heritage tradition. My grandparents, Antonio Russo and Emilia Russo immigrants from Montoro Superiore, Provincia di Salerno attended Holy Rosary Church on 6th Street in the early 1900's. 1900's. They lived on 12th Street. 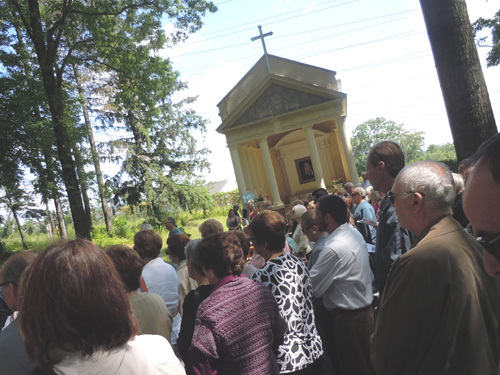 My father Emilio (aka William) Russo was baptized at Holy Rosary Church on November 18th, 1913 by Rev. 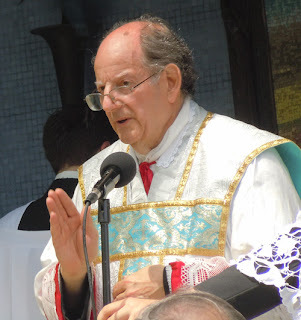 G. Spadaro and the sponsors were Vincent Giordano and Nunziata Magistris. My grandfather was previously married (or not) and had children with the surname Esposito, the Esposito's lived in Hoboken.